Jay: I have had the opportunity to read the book in electronic format. Love it! Love it. It’s like nothing else on the market, and I really mean that. It is a serious, serious book. You put some big time work into that. Jacob: I did. Yeah. I mean as you said, there’s nothing out like this book yet. 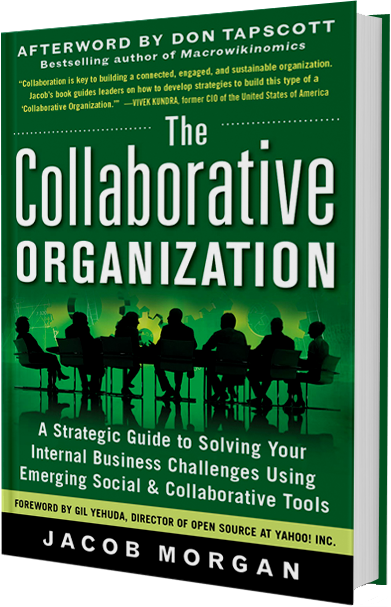 It’s the first really comprehensive strategy guide to collaboration in the work place. It’s exciting. I’m very much looking forward to it actually coming out. There’s a big need in this space, nobody’s written anything about this. So, I saw a gap and wrote the book. Jay: Nice job. Well, it’s useful too, because it’s the kind of work that you guys do at Chess. Right? The book is at some level about the kind of consulting you do. out about this stuff? Where are you going to get resources?” There’s really nothing out there, right? 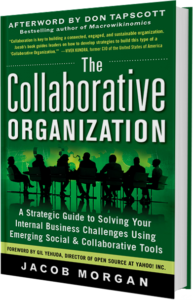 Jay: …why do people need to collaborate internally? Why is this important? you would obviously say, “No, it’s not” but why is that true? of message that collaboration makes the world a better place. friends and family. You have a more flexible work environment. You can’t just go to them and say, “Hey, collaboration’s great. you see a lot of these problems within the enterprise. Right? Jay: Yeah, I believe it. just a sad and scary number, right? mission statement kind of stuff. executives on board behind these things. without considering the culture as well. intend to either reward or reinforce? starts to get a little muddled. more time working so they can get more points outside of work. the enterprise. Kathy Sierra gave an excellent example of gamification around reading. should be inherently valuable like reading, or helping others? this house, right? It’s the same kind of idea. to do other things like status and access and stuff like that. flame with regard to this collaboration effort? important to have people on who are monitoring the community. always experiences some sort of employee/user resistance. Always. Those are the conversations that I have a quite a bit. credit card, $20 bucks a month, you’re up and running. using these tools using these platforms. we get employees to use these tools and participate? they’ve kind of got their own Skunk Works kind of program? to look at you like you’re nuts. Jay: Yeah. Single sign-on. Yeah. is positioning this as individual value versus corporate value. help you become more efficient at work. addition, chances are it’s going to be a little difficult. an example that most people are familiar with. the upside is of that? vendors are betting that email is going to go away or diminish. who you talk to, as far as the email debate goes. of money and it certainly seems that would be their play. Right? interesting strategic play for them. all just going to be like “Yeah, it’s a Microsoft product. will sit down, and we’ll just move forward from there. turn into just being an alert system or an alert notification. notified of that by email, but you won’t actually respond. Jay: …somebody has tagged you, what have you. timed it just right. It’s a really good book. valuable resource to the people that read it.